Villa 2 is identical to Villa 1 --- side by side each offers a retreat like none other. From natural lighting thoughout the day and night, the kitchen, to dinning area, the living room, to all bedrooms and bathrooms and sauna. The style, the design and function is very consistent and harmonious. Outside, there is a spacious covered patio equipped with an outdoor fan and upscale outdoor furniture to kick back and relax. The patio flows into the lush green grass backyard that leads to a inviting hot tub, directly across is the BBQ should you feel the urge to grill. Whether sitting in the hot tub, sun bathing, enjoying an outdoor BBQ together, or playing family board games on the front porch. This condo has all you need for the perfect get away. This unique condo (located in Building 1) at the Las Palmas Resort has 3 bedrooms and 2 full bathrooms. 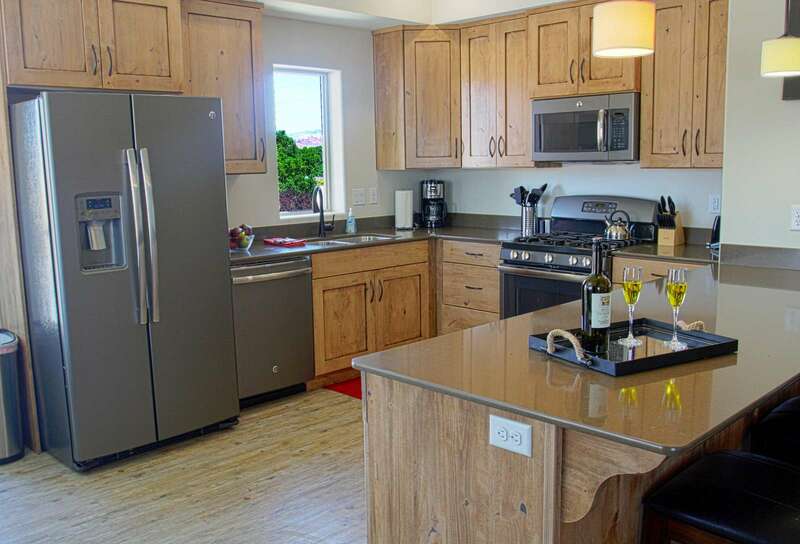 The open kitchen with an island bar is fully equipped to do any cooking you desire on your vacation. The dining area is between the kitchen and the living room allowing you to enjoy the meals as well as the conversations in an open space. 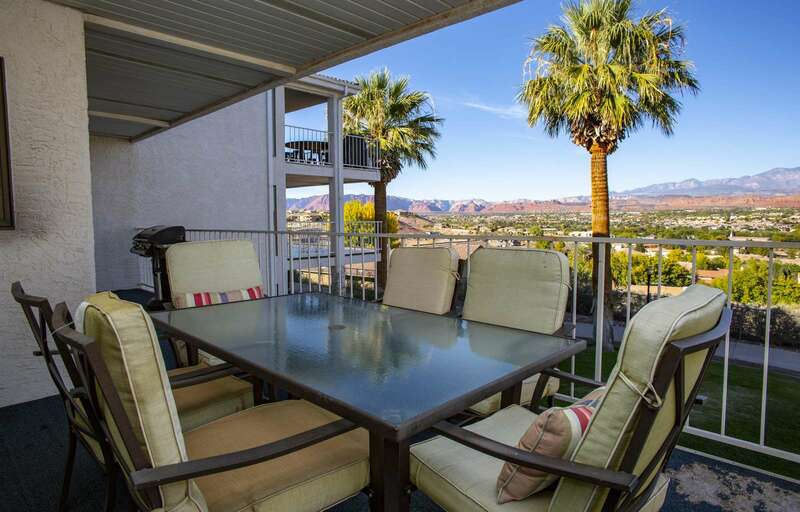 Take in the beautiful view of the vast mountain ranges and the spectacular sunsets while lounging in the comfortable patio furniture adds the perfect touch to this location. The comtemporary condo, comfortably sleeps 6 in beds with the option to sleep an additional 2 - whether it be children/infants or someone on an air mattress. These items can be rented from us during the booking process online - or you can bring your own. Another added perk about this location is the full size, front loader washer and dryer located in a neat closet on the patio. Free secured wireless internet is included for our guests to keep up with what is happening outside of this top vacation site. Searching for Sunshine and a View? 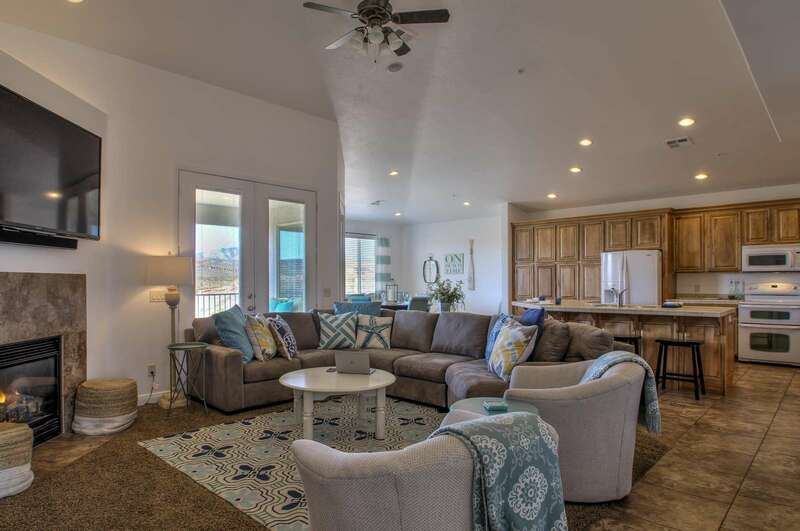 This condo is a 3rd floor, end unit, with a stunning view of Pine Valley mountains, Snow Canyon, and the vast St. George valley below. Being on the 3rd floor is great for those looking for a place shielded from the noise of other rooms. 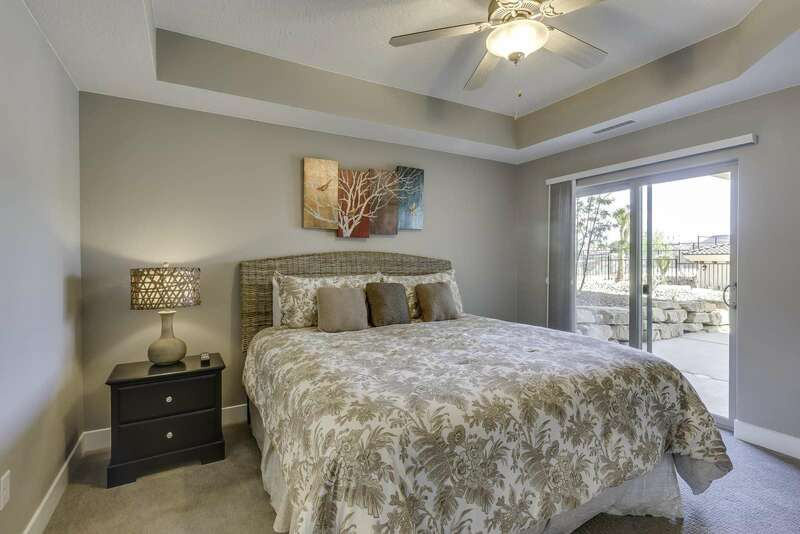 The Master Bedroom has a King memory foam mattress with a walk-out sliding glass door to the balcony. A private en Suite with garden tub will make the unwinding of your vacation complete. Like the Master room, the guest bedroom has a Queen, with memory foam mattress. Our 3rd widespread bedroom is a favorite for kids to enjoy lounging in their own space to spend quality time together! 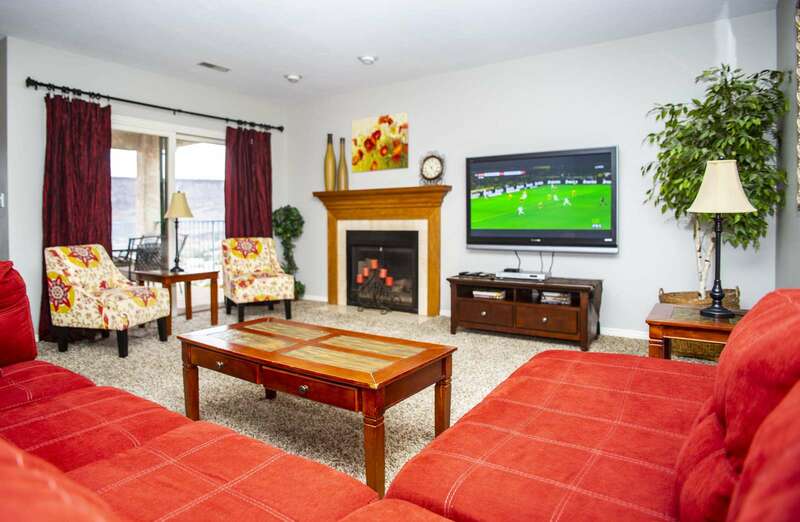 They can watch TV on the 32` flat screen, watch movies or play X-Box any time adding to the fun of the experience. This room will also sleep an adult couple comfortably in the Full size bed. The wide, fully stocked kithen, overlooks the view of the city below and the striking view of the mountains ahead. Another perk of this particular kitchen is the ample storage space for your all groceries. We cannot forget about the patio! Just a step out of the door and you have a specious place to play family games while enjoying the great weather and view that Saint George provides for us! This beauty sets on the 3rd floor of Building 16 at Las Palmas. Enjoy the inviting views from the patio of the pool amenities which are available to all Las Palmas guests starting July 1st! Palm trees, blue skies, warm weather are all included and FREE with your stay! Seating for 6 at the dining room table as well as seating at the kitchen counter. We want to welcome you to this beautifully updated condo. With 2 master bedrooms, one with a king bed, the other with a queen BOTH with comfortable and inviting linens. Each bedroom with it's own television (cable & wifi provided). As well as each master bedroom has a bathroom, one with a garden tub/shower and the other with a walk-in shower. A comfortable sofa sleeper is also available for those extra special kiddos in the group. (linens provided as well) Everyone is welcome! Come enjoy the Las Palmas Resort & let us help make wonderful memories for you! This condo has a garage that is available for guests to use. It's a single car size and you are welcome to park your "toys" or smaller cars inside. The Beautiful Poolside Las Palmas Condo on the Ground Floor, sleeps 8 comfortably in beds, with two more on an air mattress. On the ground floor of building 17 at Las Palmas is where you will find this 3 bedroom, 2 bathroom condo. It is right across from one of the favorite outdoor swimming pool at the resort - making it a great place to enjoy with the grass area and a playground off the side, fun is literally awaiting you outside your front door. If you have a family that LOVES to swim - look no farther, this is it! The fully stocked kitchen has all major appliances, plentiful cabinet space, and stone tile countertops to provide for all of your kitchen needs in a home away from home. You will enjoy the open concept design of this inviting space. The great room has a gas fireplace is in the corner to provide for a relaxing enviorment after a fun day in the sun. Bring along all of your favortie movies to maximaize the use of this great room. This room provides a plentiful amount of sitting for the whole group. The master bedroom is sizable in both room and personal bathroom, also a private screen door to the back patio.The second bedroom has a king bed with a pocket door access to the second bathroom. (Can be used easily as a 2nd master suite.) Directly across the way from this room is the third bedroom that has four twin beds. This is a favortie for the kids to have their own beds but still be spending time together. Both of these bedrooms have a walk-in closets. Private/secured internet is provided for your stay - making it safe to work away from home. A full sized washer and dryer are provided for your use and convenience. Las Palmas is a wonderful family resort offering numerous amenities for everyone in all ages. This condo also has unlimited access to Las Palmas Resort’s outdoor pools, hot tubs and Fitness Center at no charge to provide leisure for all those who come to stay with us. Each pool area provides chaise lounges and chairs. Super exciting development: Las Palmas condos now have exclusive access to The "HUB" Clubhouse and Pools (formerly known as the Green Valley amenities)! All guests will need to bring the both new POOL PASS and MEMBERSHIP to access the amenities! Daily limits apply and vary according to condo size. The floor plan is very open and welcoming to those looking for a great time on vacation with deep seated, serene furniture, beautiful decor with enough space for everyone. Only a few steps away from a playground and the large family pool - this condo is perfect for families that like to be close to the delightful amenities that Las Palmas provides. The master has a queen with a private en suite, the 2nd has a queen and the 3rd bedroom has 4 twins (2 sets of bunk beds) perfect for the kids to enjoy together. Bedroom 2 & 3 share a bathroom to provide the best environment for everyone in the house. 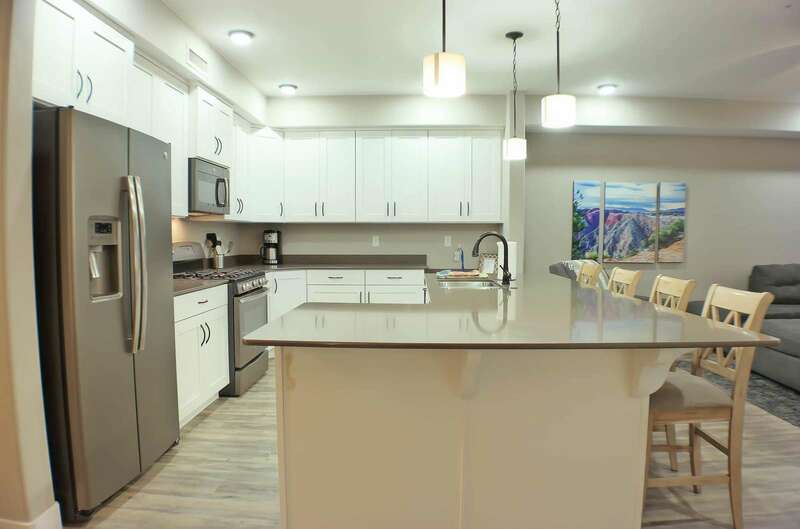 The kitchen in this condo is stocked with all major appliances and supplies, allowing you to cook anything you desire, making your stay all the better! So pack your bags and leave those things for us! This beautiful condo is ground floor, as well as an end unit with lots of natural light. 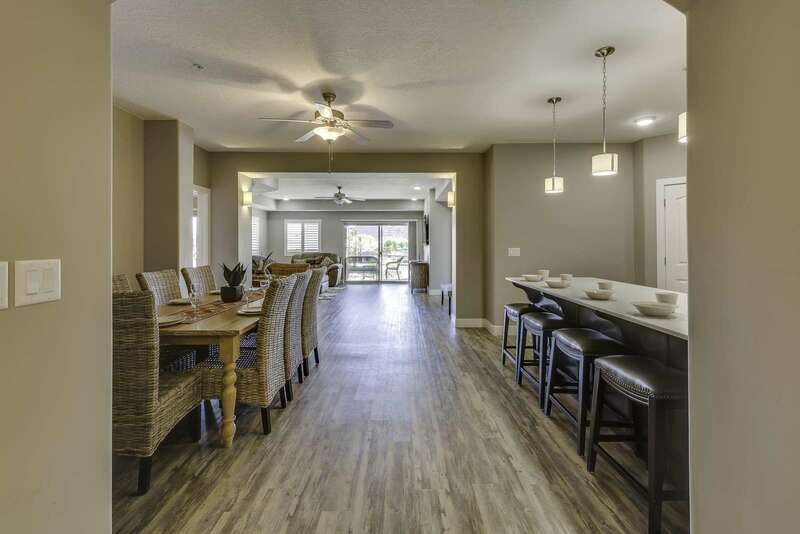 The open concept floor plan makes it easy for everyone to enjoy one anothers company - with the patio just off the kitchen you can dine in or out. No BBQ on the patio. Located in Building 19, you will enjoy all the upgrades of Las Palmas. 10 foot ceilings, wide doors which makes this condo great for those who might have a handicap or be disabled. One of the advantages of this location is, no need to worry about stairs or elevators! This beautiful condo (located in Building 19) is loaded with updated modern furniture and elegant decorations is where your next vacation begins. A very open floor plan throughout the condo will bring the upmost comfort and enjoyment to your stay. The view from the windows and the deck overlooking a swimming pool surrounded by tall palm trees is very relaxing. Everything will be provided to make your experience very comfortable and we guarantee you will not be disappointed. Master Suite has a comfortable king size bed with a large bathroom attached, private entry to patio, The second bedroom has a queen bed with a private full bathroom attached. There is a queen bed as well in the third bedroom. It sleeps 6 comfortably in beds. An open kitchen with an island bar is fully equipped to do any cooking. It is loaded with all cooking utensils and updated appliances. The dining table has 4 chairs with an additional 4 bar stools along the kitchen island bar allowing plenty of space for everyone to enjoy the meals. There is plenty of entertainment while staying at this condo. The spacious great room with modern furniture, cozy gas fireplace, and large flat screen TV & DVD is a great relaxing atmosphere for the whole party. On the large deck, there are a BBQ grill and an outdoor patio dining set if you enjoy outdoor dining as well as some lounging chairs. Free secured wireless internet for you as our guests. NO MORE THAN 8 GUESTS MAXIMUM! Atop the second floor of Building 19, in the Las Palmas is a sophisticated three bedroom, two bathroom condo. The main room includes the living room and dining area. Furnishings include a sumptuous chocolate leather sectional, terracotta suede loveseat. There is fully stocked kitchen of all white appliances and electric stove. This main room has two glass screen doors that take you to the back deck. The patio set seats six around a tiled table in various colors of mocha (BBQ on deck as well). The view from here over looks the oasis pool area. The right end of the hall takes you to two other bedrooms. This first room has a queen A small upholstered chair in a textile of blues, browns and cream in the corner. At the opposite side of the room there is a Twin size captain bed with storage and trundle dressed in a denim fabric of white and navy. The second bedroom catty-corner to the first also has a queen size bed and has a thirty-two inch flat screen. The master bedroom has a private en suite with double sinks and a deep garden tub. The bedroom has a king size bed walnut frame head and foot boards with built in drawers on either sides of the bed. As you relax in bed you can enjoy a forty-nine inch flat screen. This bedroom includes sliding glass door access to the deck. All rooms have ceiling fans to help keep you cool in the warm nights. This Condo has feel of modern chic with accents of traditional and Art Deco that provide its charm. Let us contribute to you making delightful memories with your family during your stay in this condo! 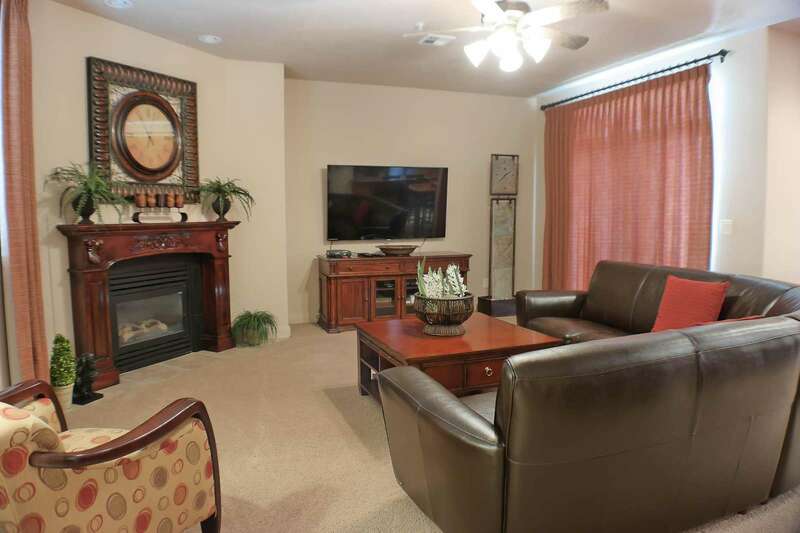 Our ground floor condo in Building 20 is gorgeous with comfortable furnishings and a very open floor plan throughout. The spacious great room with comfortable furniture has an enjoyable atmosphere for the whole party. A large flat screen TV with DVD/VCR, plenty of great movies, reading material, and cozy gas fireplace are just a few to mention why this place is unbeatable.This location has a lovely open kitchen with an island bar, fully equipped to do any cooking. It is loaded with all cooking utensils and updated appliances which includes a double oven. There is patio dining furniture on the deck if you enjoy outdoor dining. The unobstructed views from the patio are incredible as well! The hall bathroom is elegant and has a walk-in shower which accommodates wheelchairs and disabilities easily. Master Suite has a comfortable queen size bed, private entry to deck, TV/DVD, and ample storage space for your personal belongings. The second bedroom has a queen bed with a TV as well. There are two twin beds in the third bedroom. It sleeps 6 comfortably in beds - a queen air mattress may be provided (with an additional $25 charge) upon request for 2 additional people. Let us contribute to you making delightful memories with your family during your stay in this condo! If your standards are high when choosing a vacation rental then this is where your next vacation begins! Customer service and satisfaction is our #1 priority. You will not be disappointed when you walk into this condo at the Las Palmas Resort.The condo is located on the ground floor making it handicap accessible. There will be a key provided for access to the swimming pools and hot tubs within a short walking distance from the unit. 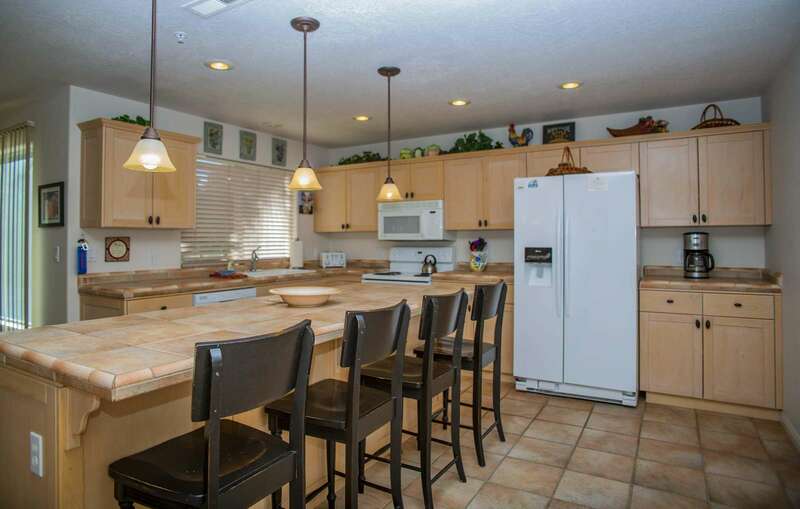 Enjoy our pleasant 3 bed/3 bath condo located in building 20 at the Las Palmas Resort. 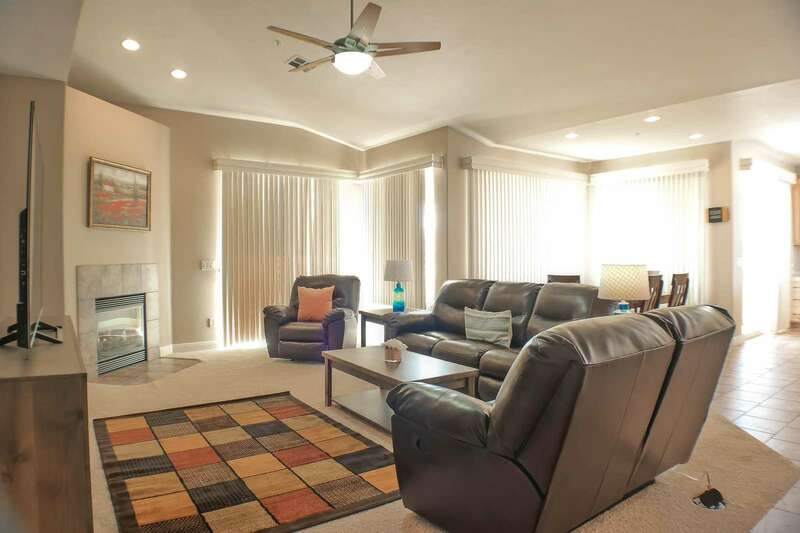 This condo has a very open floor plan.There is plenty of entertainment in this condo. Each room is equiped with a TV, as well as the living room with the option to watch DVDs. Bring a long your favorites to unwind and watch after a fun day in the sun. Our kitchen provides all major appliances accompanied with utensils and sits right next to the dining room with a family table as well as more seats on the bar of the kitchen for extra sitting. 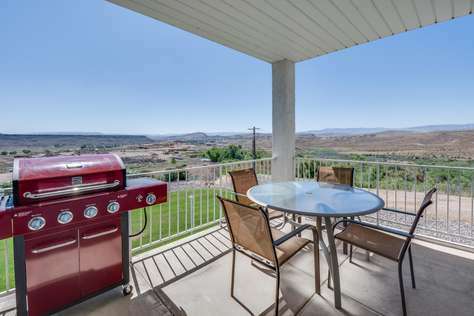 At a glance you will see the sliding door that leads out to the patio that has room the family to eat, play games, or admire the incredible view that the vast mountains of the Saint George Valley creates for us to enjoy. Our master and 2nd bedroom both have private bathrooms with the 3rd bathroom being across the hall from the twin bedroom. It has that space needed for everyone. 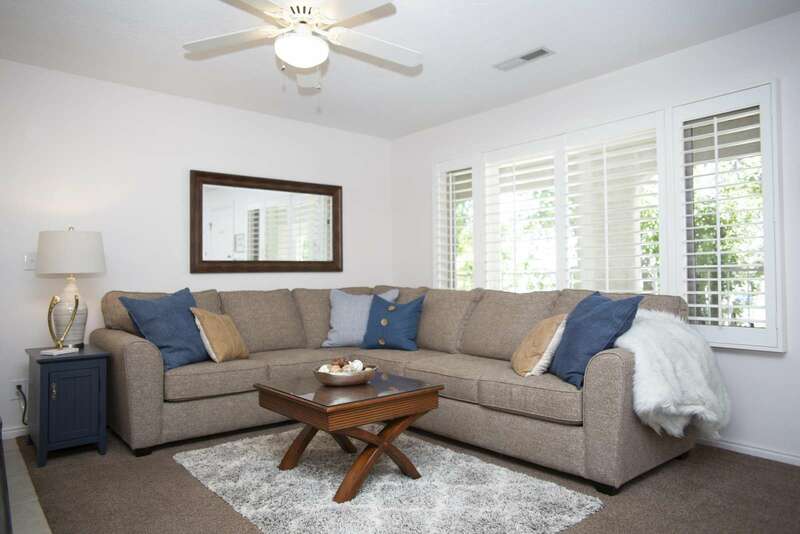 Master Suite has a comfortable king size bed with a large bathroom attached, private entry to patio, TV/DVD, and ample storage space for your personal belongings. The Queen Bedroom and the spacious Bedroom with twin beds are lite with bright colors to bring welcoming feeling in the room. If your standards are high when choosing a vacation rental then this is where your next vacation begins! Customer service and satisfaction is our #1 priority. You will not be disappointed when you walk into this condo at the Las Palmas Resort. Free secured wireless internet for you as our guests as well as a full washer and dryer for your own personal use. This condo also has unlimited access to Las Palmas Resort’s outdoor pools, hot tubs and Fitness Center at no charge. Looking for a retreat to St. George, Utah? Whether you're golfing, biking, hiking, shopping or just relaxing, you will enjoy staying in this amazing Las Palmas condominium. Located on the 3rd floor, end unit of Building 20 (one of the newest at the Las Palmas Resort). 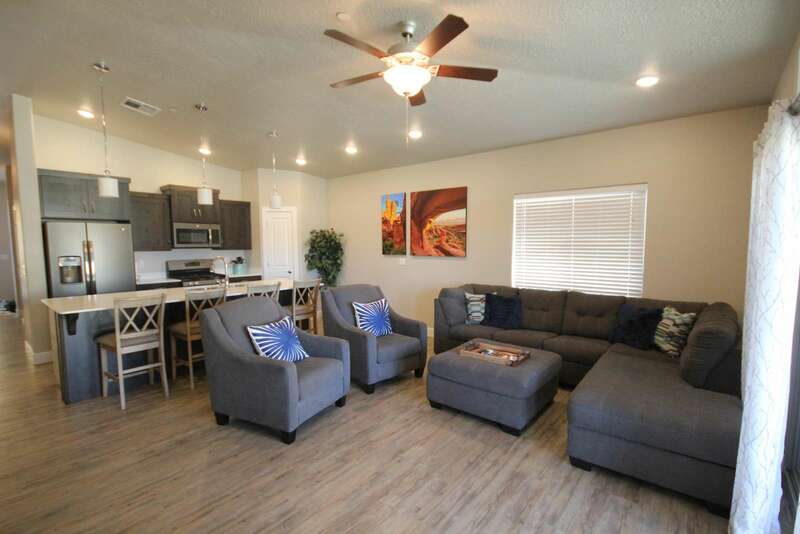 You will enjoy this newly renovated 1,360 square foot condo with very comfortable furniture, fully stocked beautiful kitchen appliances & modern decor and furnishings and fabulous views of the desert mountains through oversized windows. An open floor plan with a dining area and family room with modern furniture makes a great environment for everyone. A new 65' flat screen 'Smart' TV with a DVD player will make watching movies more enjoyable. The patio is a nice size with a barbecue grill and dining for 4. The Master Suite has a queen bedroom set complete with 32' flat screen TV and a private en suite. This room also has a private entry to the patio. The second bedroom has a queen bed as well as a bunk bed with 2 twins. With a private entrance to the second bathroom. This unit will comfortably sleep 8 in beds which includes a full size sofa sleeper in the living room. This can be a great addition to any of our Building 20 condos - especially if you have an extra large group who wants to stay close to one another, but also might need a few more bedrooms/bathrooms. This is a very classy, spacious property is located in the upscale Las Palmas Resort. The living room and and fully stocked kitchen have all the comforts of home allowing you to go on full relaxation mode. The master suite has a king size bed and adjoining en suite. This room has a patio entrance where you can gaze at the beautiful views of the red mountains and surrounding areas. The second bedroom has a queen size bed and a sliding door entrance to the smaller bathroom. A queen size bed also resides in the third bedroom. This condo has access to two pools, gym and playgrounds on site, and private/secured internet for your stay - making it safe to work away from home. Las Palmas is only 10 minutes from Tuacahn, downtown St George. This beautiful condo is the perfect getaway all year round. The top, third floor (end unit) of building 21 at Las Palmas is where you will find this sophisticated, charming, 3 bedroom/2 bathroom condo that is a great place for family to make life long memories together. This sizable kitchen that has six barstools, stainless steel appliances and an electric stove, sufficient cabinet space & stone tile countertops. A perfect place that provides all you need to whip up those favorite family meals! The dining set has 8 chairs to fit your entire group. The living room furnished with a cushy, dark chocolate sectional, two matching textured leather chairs and rocker. For those cold winter nights there is an electric fireplace. The master bedroom king size bed with adjoining en suite has a garden tub. Another nice feature is this room has access to the back patio. The second bedroom has bunk beds. Both mattresses are queen size, this room has a sliding door access to the second bathroom, while the third bedroom occupies a queen size bed. Both of these bedrooms have a walk-in closet. The added perk of this location is kitchen and living room both have screen door access to the back porch. Patio table seats four and has a lot of space for the rest of the family. The view from the patio overlooks an unobstructed view of desert hills and a small portion of Bloomington. It is a great place to enjoy a meal together or play family games. If your standards are high when choosing a vacation rental then this is where your next vacation begins! Customer service and satisfaction is our #1 priority. You will not be disappointed when you walk into this condo at the Las Palmas Resort.Free secured wireless internet is included for our guests. At the top of the third floor (of building 21 at Las Palmas) is where you will find this wondrous Southwest retreat. This location is unique in that there are two master bedrooms. Both have King size beds, en suites, garden tubs and sizable walk-in closets.The main hall opens into the largest room in the condo that encompasses the living room, kitchen and dining room. The living room has a 60 in’ HDTV with DVD and electric fireplace. The vast fully stocked kitchen consists of an island that can seat up to 7. All countertops are granite, the appliances are black and electric stove, everything you would need to make your favorite family meals adding the perfect touch to your home away from home. The dining room seats 8. Between the living room and dining area is a door that opens to the patio & BBQ grill - the patio table seats six. From this vantage point is an unobstructed view of desert hills and a small portion of Bloomington. At the opposite end of the main room there is a third bathroom and two more bedrooms. One of the rooms has a queen size bed while the other is perfect for the kids having two sets of bunk beds, each mattress is twin size, allowing everyone to have their own bit of space. 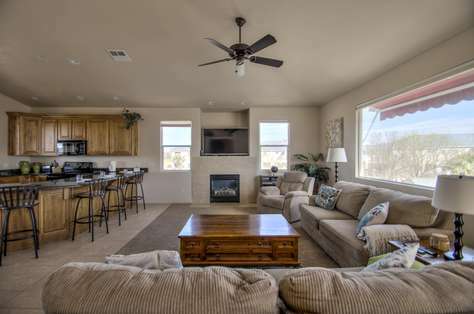 This condo is the perfect southwest getaway with the modern comforts of your own home. Let us contribute to you making delightful memories with your family during your stay in this condo! Come enjoy our Custom Vacation Home nestled in a very private, high end residential area with incredible views. It is located on a very quiet street where the back yard backs to undeveloped BLM, red rocks land with stunning mountain views. It is also located near the Green Springs Golf Course - within a 2 minute drive to clubhouse. Our home has been decorated with top of the line travertine floors, a gourmet kitchen with reverse osmosis water purification to sink and refrigerator/ ice maker. You will find that our fully stocked kitchen features a gas cook top, wall oven and microwave. All is provided for you to whip up your favorite family meals. The dining table has seating for 8 and a bar with extra seating for 4. A master bedroom with seating area and private access to the backyard, a 47” plasma TV, with en-suite bathroom, jetted tub, walk-in shower and double sinks. The second guest bedroom is beautiful and has a queen bed and is located next to the hall bathroom. A third guest bedroom has a full size bed - new this year. This is a great room for small kids who need to be close to their parents OR an extra room for adults. It is perfect for everyone. Our main great room features a beautiful gas fireplace, 58” plasma TV, large sectional sofa and large windows providing a perfect view of the pool and red rocks. This home also features a mini-kitchen (sink & fridge) as well as a second living room in the lower level with a pass through to theater room. 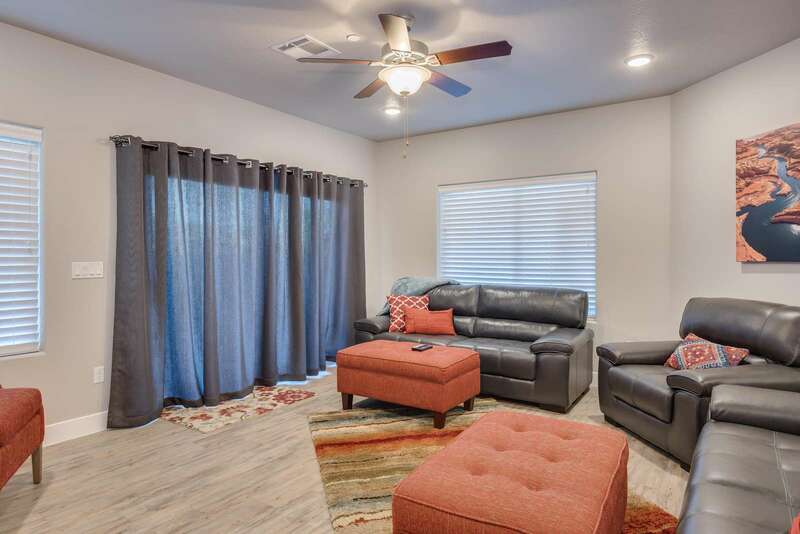 There are 2 bathrooms, 3 bedrooms (2 queen, 1 Full & 2 Twin), full size laundry room for your used and convenience, family room with plasma TV, sectional sofa, standard pool table, as well as direct entrance to backyard. If all of this hasn’t surpassed your wildest dreams and expectations of a vacation home then just listen to what we have to offer OUTSIDE. A 60 foot pool with a jetted spa is heated year-round for your use! The backyard/patio is landscaped with palm trees and comfortable outdoor furniture to enjoy while watching the 47” plasma TV with an outdoor sound system. There is also a fantastic grill with a bar/counter and 4 barstools. The backyard is enclosed and gated. A perfect place for your group to make plenty of good memories that will last a lifetime. There is garage parking available for 2 vehicles with additional off street parking on property if needed. PLEASE NOTE: Maximum occupancy is 14 guests TOTAL, no exception. Children are included in the total occupancy. This number is determined by City Codes and we must comply in order to keep our license. d. Any other acts which interferes with neighbors’ right to quiet enjoyment of their property. PLEASE NOTE: Maximum occupancy is 14 guests TOTAL, no exception. Children are included in the total occupancy. This number is determined by City Codes and we must comply in order to keep our license. Thank you for your cooperation. Living in Luxury! A fresh style & comfortable furnishings....did we tell you the beds are AMAZING! (Everyone says we have extremely comfortable beds. They always ask where we bought them!) The open floor plan of this condo brings a welcoming and bright feeling to all those who come inside. The kitchen has matching appliances and all needed supplies allowing, you to have everything you need to whip up your favorite family meals. To the right of the kitchen you will find a dining table with 4 seats as well as additional seats at the kitchen bar. Should you choose to spend some time outside there is an outdoor patio where you can dine outdoors together as a family or relax and play games as a family after a fun day in the sun! This spacious condo features 3 bedrooms. Bedroom 1 & 2 have King beds, Bedroom 3 is perfect place for the kids as they will be together but all in their own beds. There are two bunk beds with full beds on the bottom and twins on the top. All of the bedrooms private en suites connected to them as well as ample storage. This condo is a ground floor unit and has easy access from the patio to the swimming pool/hot tub. You will enjoy the free high speed secured wifi & Dish Network. To sum up, It has everything you are looking for! You have now found your, "Home Away from Home". *Just steps to the pool! *ATV, Mountain Biking can be accessed from the condo. The GAP, one of the most famous trail riding area in the area, is just outside your door. This is like not other condo you've ever rented, 4 bedrooms and 4 baths! Perfect for large families & reunions! A few quick steps from the pool, that is always heated during the winter months. You can sit outside and watch the family swim, play in the grass or host a group BBQ. 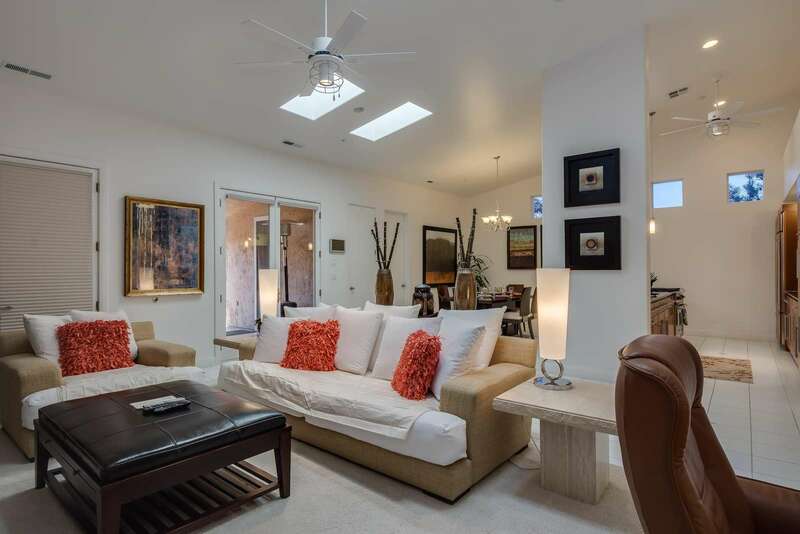 This very spacious, open floor plan condo is great to spend time with family! We love it here. From the kitchen to the living room there is everything that you will need to make this a memory that you will cherish for a lifetime. The kitchen is stocked with all major appliances and utensils that you will need to create your favorite family meals. At the kitchen bar there are 4 chairs, directly across you will see the dining table. 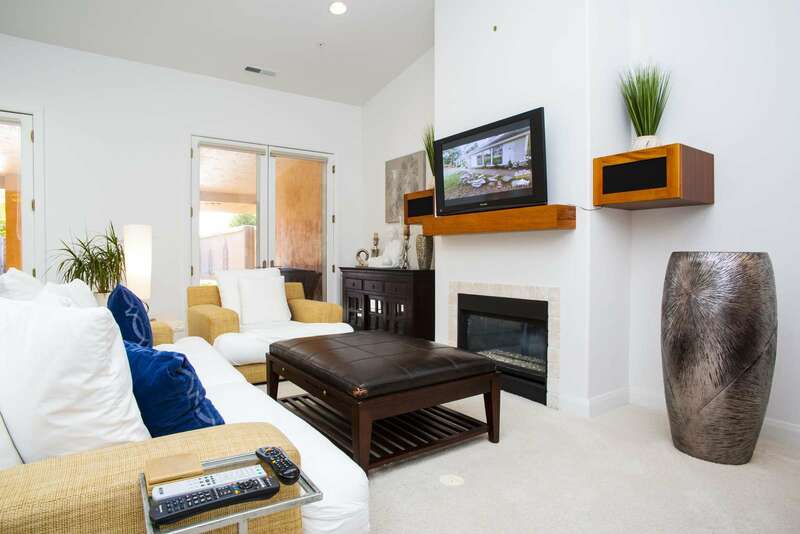 The living room is a great place to relax and watch TV on the massive flat Screen after a fun day in the sun. In just a few steps from the Living room, you will be led out to the patio where you can play games, enjoy a meal together or watch the kiddos as they enjoy the pool that is not far from the backyard. Three of our bedrooms in this great condo have a King Bed with a private En suite. There is a TV in each of these bedrooms! Bedroom 4 is the favorite among the kids! It has 3 bunk beds with 2 Twin over Twin and 1 Twin over Full (4 Twin, 1 Full). Everyone who stays in this room enjoys being together but also has enough personal space, PLUS - 2 additional sleeping mats, a pack-n-play and a high chair. Ample amount of storage space in all the rooms and bathrooms, so unpack and make yourself comfortable. This condo is a ground floor unit and has easy access from the patio to the swimming pool/hot tub. You will enjoy the free high speed wifi & Dish Network. It is the perfect place to get away together and make memories! *ATV, Mountain Biking can be accessed from the condo. The GAP, one of the most infamous trail riding area in the area, is just outside your door. You might not ever want to go home once you've stayed with us. This is the condo where you have everything you need. The fresh, new feel & the stress free environment makes staying here priceless. Your family will ask to come back again & again! The open floor plan gives you a homie and welcoming feeling as you enter the house and see the beautiful décor and bright colors. The kitchen is a great asset in this condo and is fully stocked will all major appliances and utensils that you will need to whip up your favorite family meals. There is a bar in the kitchen with 4 seats and right across the way is the dining table. The first two bedrooms include a king size bed, a private en suite, and an ample amount of storage space from the personal belongings that you bring from home. Bedroom 3 has 2 Bunks each with a twin over full, with a private en suite. PLUS - there are 2 additional sleeping mats, a pack-n-play and a high chair. This is a perfect condo for those who want to have space to be together as a family but also enjoy the personal bathrooms that each of these bedrooms supply. Since this is a ground floor condo, right through the kitchen and living room is a patio where a table and chairs are provided. 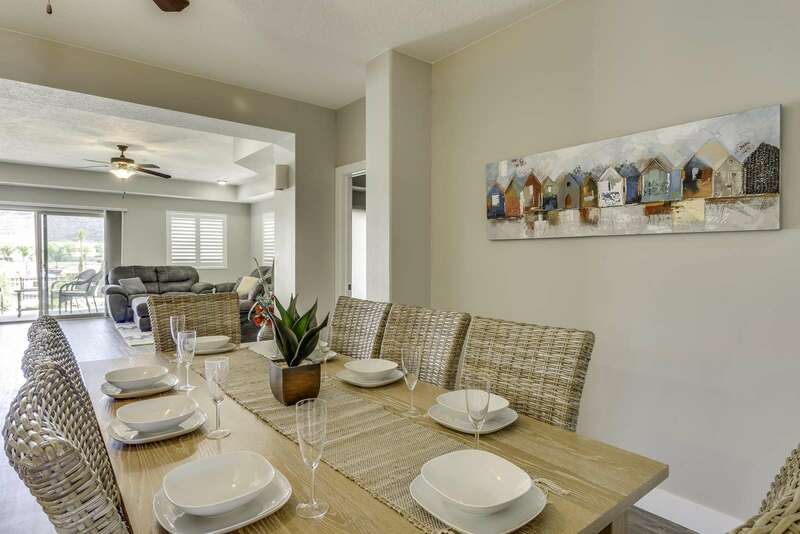 This is a perfect setting to sit and enjoy, play family games, or dine together after a fun day in the sun, and has easy access from the patio to the swimming pool/hot tub. It's a great place to play in the grass, lay down a towel & read a book! You will also enjoy the free high speed and private wifi & Cable TV. 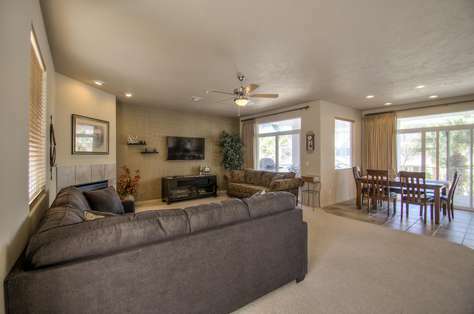 This 3 bedroom, 3 bath at the new Estancia Resort will have you wishing you could stay longer. The kitchen has matching appliances and all needed supplies allowing, you to have everything you need to create your favorite family meals. To the right of the kitchen you will find the dining room. Should you choose to spend some time outside there is an outdoor patio where you can dine outdoors together as a family or relax and play games as a family after a fun day in the sun! This expansive condo has 2 master suites with king beds and private en suites. The 3rd bedroom has 2 Full and 2 Twin (bunks). Does someone snore or flip/flop all night? - Put them on the Sofa Sleeper (bedding provided). You will enjoy the free high speed secured wifi & cable TV. It is the perfect place to get away together and make memories, so come down and spoil yourself! This you are seeing doubles??? Well, you are!!! This condo is an exact replicate of Condo 103. Side-by-side you will find this beautiful condo is BRAND NEW to the Green Valley area of St George. You will enjoy a very open floor plan throughout the condo that will bring the upmost comfort and enjoyment to your stay. The view from the windows and the deck overlooking a swimming pool surrounded by tall palm trees is quite relaxing. Everything will be provided to make your experience very comfortable and we guarantee you will not be disappointed.The open concept floor plan, brings the fully stocked kitchen, dining, island bar and living room together allowing plenty of space for everyone to enjoy cooking, eating meals together and relaxing at the same time. There is plenty of entertainment while staying at this condo. The spacious great room with modern furniture, a large 50" flat screen TV & DVD is a great relaxing atmosphere for the whole party. The patio, has outdoor dining set and lounging chairs. 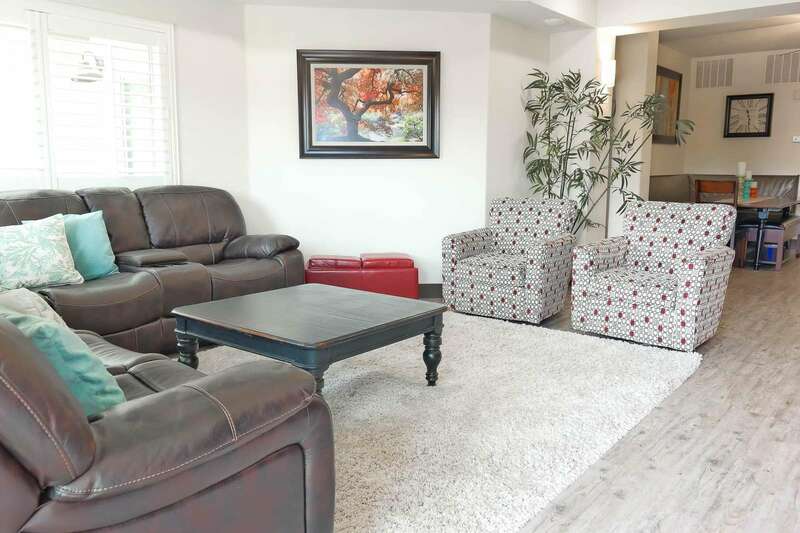 In this condo all 3 bedrooms have queen size beds and private en suites connected to them as well as ample storage. Master Suite has a private entry to patio, 40" flat screen TV. It sleeps 6 comfortably in beds. NO MORE THAN 8 GUESTS MAXIMUM! (Guests 7 & 8 will have to use an air mattress/cot/pack-n-play,etc.) Estancia is a wonderful family resort offering a beautiful swimming pool, hot tub, pickle ball courts & basketball court - this can be enjoyed by everyone of all ages. - Smart TV's in Every Room! Need additional rentals close by? Condo 102, 103, 104 & 105 are all together along the ground floor. Makes for a perfect place to stay with a large family reunion, team sporting events, etc. Give us a call!! 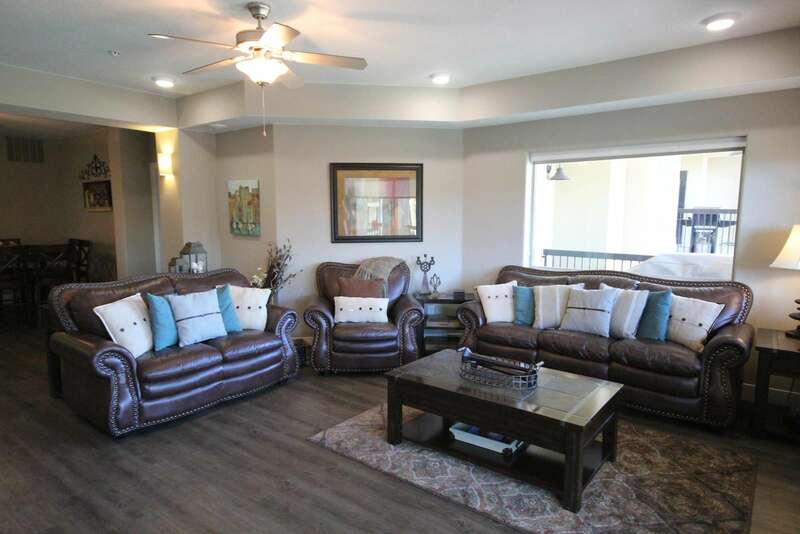 This beautiful condo is BRAND NEW to the Green Valley area of St George. 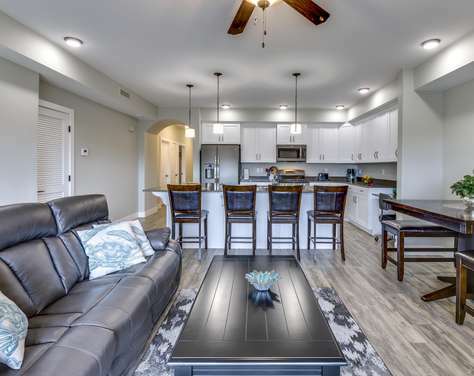 You will enjoy a very open floor plan (which is a mirror to W102) throughout the condo that will bring the upmost comfort and enjoyment to your stay. The view from the windows and the deck overlooking a swimming pool surrounded by tall palm trees is quite relaxing. Everything will be provided to make your experience very comfortable and we guarantee you will not be disappointed.The open concept floor plan, brings the fully stocked kitchen, dining, island bar and living room together allowing plenty of space for everyone to enjoy cooking, eating meals together and relaxing at the same time. There is plenty of entertainment while staying at this condo. The spacious great room with modern furniture, a large 50" flat screen TV & DVD is a great relaxing atmosphere for the whole party. The patio, has outdoor dining set and lounging chairs. In this condo all 3 bedrooms have queen size beds and private en suites connected to them as well as ample storage. Master Suite has a private entry to patio, 40" flat screen TV. It sleeps 6 comfortably in beds. NO MORE THAN 8 GUESTS MAXIMUM! (Guests 7 & 8 will have to use an air mattress/cot/pack-n-play,etc.) 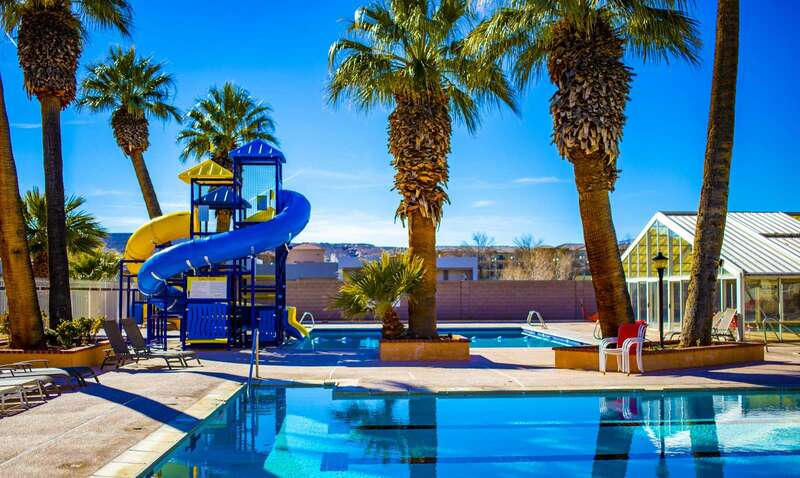 Estancia is a wonderful family resort offering a beautiful swimming pool, hot tub, pickle ball courts & basketball court - this can be enjoyed by everyone of all ages. It is the perfect place to get away together and make memories! 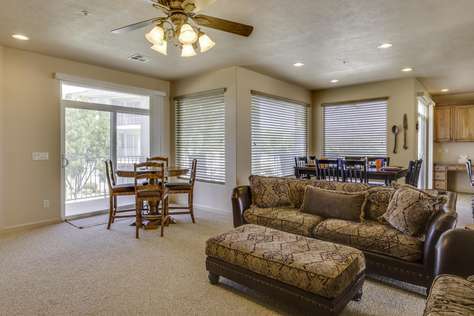 Your family will truly enjoy staying in this comfortable 2 bed/2 bath condo at Estancia. With everything you need while on vacation. Whether traveling with just your own family or with friends - there is ample space for 10! The bed sizes in this location are, 1 King in the master bedroom, 1 Queen + 2 Twin (Bunk) in the second bedroom. There are also be Sofa Sleepers (full size) in the living room. This condo is large enough to accommodate all these bodies so come and enjoy a stay at the Estancia Resort come bring your friends and enjoy the summer! 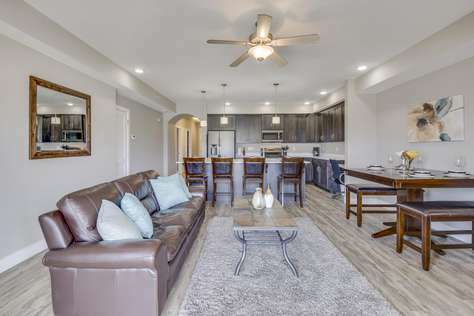 These 3 bedrooms & 3-bathroom condo is styled with the latest decor and furnishings that are sure to impress and meet all the needs that you are looking for to provide a great environment to make memories that will last a lifetime. The condo has 3 bedrooms and 3 full bathrooms Master Suite has a comfortable king size bed private entry to patio. The second bedroom has a queen bed and there are 4 full beds in the third bedroom. All three bedrooms have private en suites attached to them. The laundry room has a full-size washer and dryer to help lighten the load that you have to bring from home. It sleeps 12 comfortably in beds. NO MORE THAN 14 GUESTS MAXIMUM! There is plenty of entertainment while staying at this condo. The spacious great room with modern furniture, and large 50" flat screen TV & DVD is a great relaxing atmosphere for the whole party to enjoy after a fun day in the sun. On the patio, there is outdoor dining as well as some lounging chairs and creates a beautiful view of the Saint George Valley. Estancia is a wonderful family resort offering a beautiful swimming pool, hot tub, pickle ball courts & basketball court - this can be enjoyed by everyone of all ages. 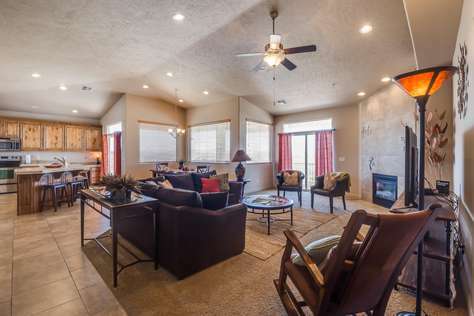 This 4 Bed / 4 Bath at the Estancia Resort is a great fit for any family. 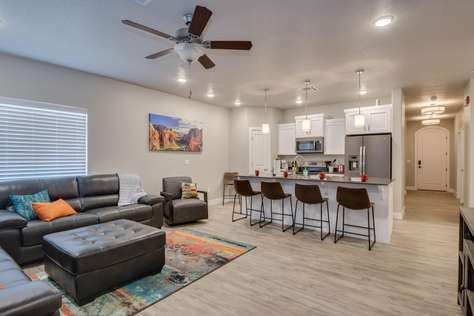 Our casual atmosphere allows you to chill out and enjoy having the best of Southern Utah within easy walking distance of the sun, pool and outdoor entertianment - ALL of which we are most famous for. Pull up a lounge chair and bask by our lagoon-shaped pool surrounded by tropical foliage where you can let your cares melt away.